1 Follow the way of love and eagerly desire gifts of the Spirit, especially prophecy. 2 For anyone who speaks in a tongue does not speak to people but to God. Indeed, no one understands them; they utter mysteries by the Spirit. 3 But the one who prophesies speaks to people for their strengthening, encouraging and comfort. 4 Anyone who speaks in a tongue edifies themselves, but the one who prophesies edifies the church. 5 I would like every one of you to speak in tongues, but I would rather have you prophesy. The one who prophesies is greater than the one who speaks in tongues, unless someone interprets, so that the church may be edified. Paul says for us to eagerly desire gifts of the Spirit, and tongues is one of those gifts. That’s a plus. In vs4, we’re told that speaking in a tongue edifies the person, which many take to be a negative because you’re supposed to edify the body. But that’s exactly what Paul is getting at – let’s edify the body. Hence his instructions to give an interpretation when publicly using this gift. We just need to read on to vs5. So there is opportunity for both the individual used in tongues and the body to be edified. Can you see the problem? In vs22, we read that the gift of tongues is a sign for unbelievers. And in the very next verse, we read that, if all are speaking in tongues, and an inquirer-unbeliever comes into the gathering, will this not have a negative effect, leaving this people to conclude that they are amongst lunatics?! So there we go. Tongues can make things a bit crazy, leaving us perceived as lunatics! And, so, what I find is that people choose one of two options: a) either strike its use altogether or b) designate it solely to small groups and prayer meetings. But what is going on in this passage? I’d posit we are missing something here, especially if we hone in on 1 or 2 verses. However, we must not forget how Paul is using an Old Testament example to show why this gift is still needed, as it’s used in a correct way. Here, Paul is quoting from Isaiah 28:11. It’s important to understand the context of what was spoken to Israel a long time ago. Within that specific situation, Isaiah is warning of the judgment that would come upon the people of Israel for all of their disobedience, idolatry, etc. And so, by ‘strange tongues,’ God would speak to this people. This reference was to the Assyrian armies who took the Israelites captive, ransacking the northern tribes of Israel. Of course, guess what? The Assyrians spoke a different, foreign language from the Hebrew people of that day. 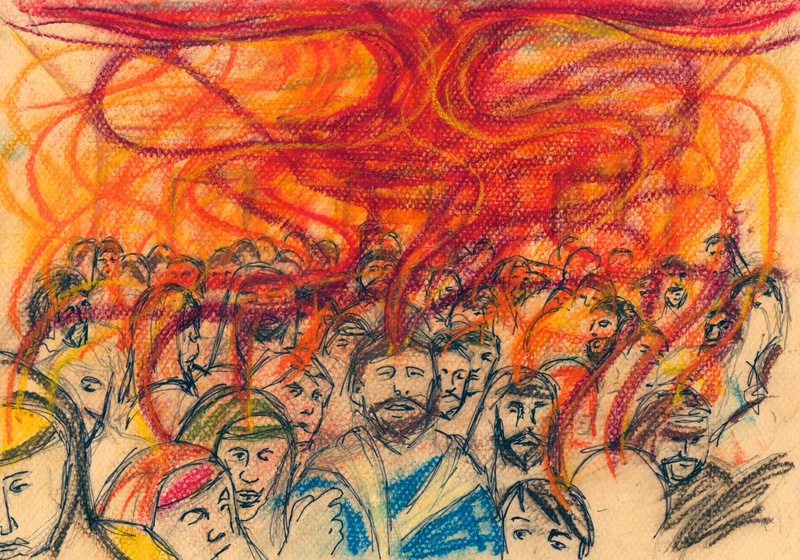 And, so, what Paul alludes to in 1 Cor 14, by referring back to the words of judgment in Isa 28:11, is that, if the church gathers together and all speak in unintelligible, and uninterpreted tongues, such will become that negative sign of judgment for outsiders who have come in to the gathering – like it was for Israel of old. To this, Paul says you are not utilising the gift in a proper manner. For remember, it is uninterpreted tongues that function as a negative sign. However, interpreted tongues in the public setting are good. That’s the context of the passage in 1 Cor 14. When you use the gift of tongues in a public setting of proclamation, follow up with an interpretation. If you do so, you alleviate it acting in a negative sense, as in a sense of judgment upon these non-believers and inquirers. Let’s not go there, so that we can draw these non-believers unto Christ. Also, just as a practical side note, I’ve been in gatherings where, once a tongue has been spoken and followed by an interpretation, one of the leaders has also followed up with an explanation of what has taken place, just to provide a little more clarity into this good gift of God’s Spirit. Following the words we just examined, Paul goes on to state that when the church gathers, people come with all sorts of giftings, including tongues and interpretation. Why, you’d expect him to end off with those two gifts! But he wants things to be done in an edifying way – so let’s keep it to about 2 or 3 public messages in tongues, followed by an interpretation (and, noting 14:13 I believe the tongue-speaker can also be the interpreter). However, if there is certainty that no interpreter is available, then the person is to offer the tongue to God at a personal level. I am very aware it’s much easier to shepherd a church without giving space for the gifts of the Spirit, and especially tongues. Hey, it’s even easier if you don’t allow for spontaneous prayers, songs, testimonies, etc. Keep it to 3 songs and sermon, right? But I am convinced that if we do not allow for these beautiful, and sometimes spontaneous gifts of God, we will be found lacking in many ways. The Spirit is sovereign and can break in as he desires. But it’s even greater when the heart of the community of Christ is already open to his word, his acts, his work through the multi-varied gifts of the Spirit. This entry was posted in 1 Corinthians 14, Gifts of the Spirit, glossolalia, tongues and tagged 1 Corinthians 14, Gifts of the Spirit, glossolalia, tongues. Bookmark the permalink.